Prague has a healthy collection of bars, pubs and restaurants and if you are planning to visit this charming and beautiful city in the Czech Republic in Central Europe then it is a great idea because you can not only plan some great sightseeing (the rich collection of churches, cathedrals and sactles will impress you immensely), but enjoy a vibrant nightlife and some good drinks too. 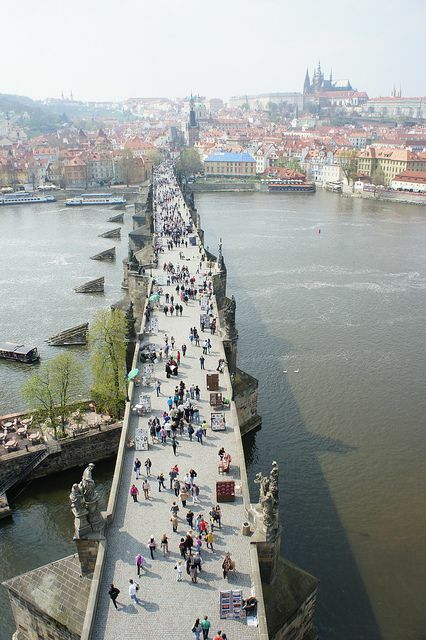 You can arrange for a tour to Prague by getting in touch with a reputed travel agent, who will help you plan your vacation in intricate detailing. Your agent will also arrange your stay at one of the best hotels in Prague. To move around in the city and have a great time you can go for affordable Prague car hire. And when it is night time you can hit the bars and have a very good time. Lavka Bar and Pub – Is an air conditioned bar frequented by tourists and locals all through the year. The highlight of the bar is the dancing girls. Girls come dancing on the podium and the spirit of the dances grow as more and more admirers come in to watch. You can enjoy some great drinks and wiggle your feet in the hard party music. This bar is situated on the banks of River Vltava and quite near to the Charles Bridge. Kampa Park Restaurant – Enjoy the company of friendly locals and drink some great cocktails while in the restaurant. The views are also terrific here. The stunning view of the River Vltava adds to the mystical ambiance of this terraced restaurant. The restaurant boast of over 150 international vintage wines and if you love wines, this is the place to drop in. Bugsy’s Cocktail Bar – Visit this popular bar on one of your nights in Old Town, Prague. This bar is highly popular for its service and the respectful behavior of the staff. You can choose from over 90 rums, 120 malt whiskeys, several bottles of champagne and a huge assortment of best quality vodka. Bily Konicek Restaurant & Jazz Club – For tasty traditional Czech cuisine and other international recipes you must visit this restaurant. The music level is maintained at just the right volume so you can enjoy dinner conversations with your companion. Plenty of people are attracted to this bar because it still has that mesmerizing medieval architectural charm. Bellevue Restaurant – Considered a premier restaurant, many people are drawn here because it sits in a chateau like building and offers enchanting views of the river. The food is also superb and they are well known for their succulent lamb chops, expertly prepared fresh fish, tender steak and roasted duck leg. And their wine list is even more impressive with French wines and champagnes. Good food and drink, that’s what you get here. You can travel to Berlin, which is just 360 kilometers, Vienna, 300 kilometers and Frankfurt, just 512 kilometers from Prague. You can also visit Austria, Germany and Slovakia, the neighboring countries of Czech Republic. There are several direct flights to Prague from European countries like Paris, London, Edinburg, Franfurt, New York and Toronto. Previous story Is Your Seo Company Doing the Work Effectively?